Navan Adventure Centre | Outdoor multi-activity Adventure Park situated in the Boyne Valley, Co. Meath. Fun, fun fun! From themed party rooms to a myriad of exciting adventure activities - we have the package to make that birthday extra special. The family that plays together, stays together. Check out our fun-packed packages for all ages. Our school packages are jam-packed with plenty of outdoor adventure activities, games and challenges. We’ll even throw in the mud for free! Team bonding and motivation through fun adventure games and challenges. We are a one stop shop for Hen Parties! We can take care of everything for you from start to finish. Guaranteed Laugh Out Loud Fun! With Adventure Activities, Games, & Fun Challenges. Football played to the rules of golf “mostly”. Off-Road Pedal Go-Karting is a great activity to really test your energy levels in a fun way. The perfect icebreaker to any activity package, lots of quick-fire old school games to get the fun times going. On our fun, exciting and challenging obstacle courses you will encounter many physical challenges! 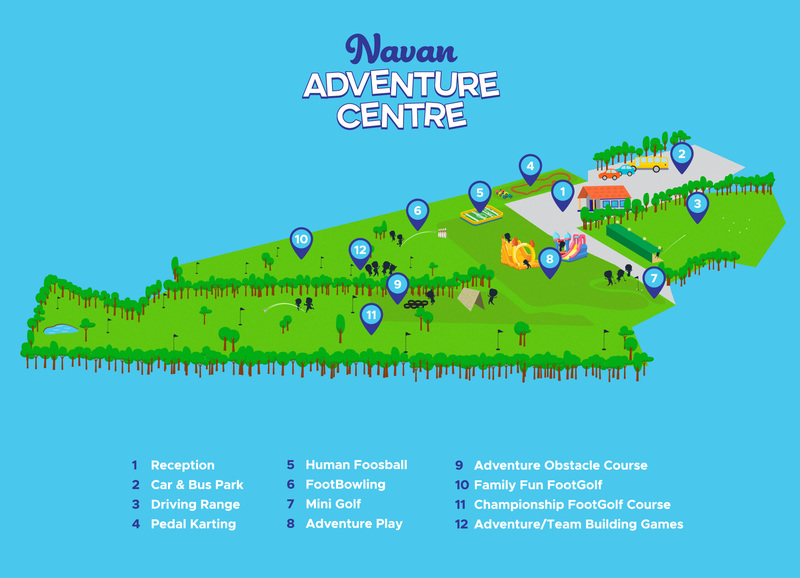 Use this map to plan out your own adventure at Navan Adventure Centre. "Brilliant day. Well worth a trip. Kids had a ball, a great family day out & an opportunity for lovely photos.. staff were great too.. Really enjoyed today."